Roscommon Civil Defence crews were out on Saturday 5th May providing medical support for the Cycle against Suicide from Tubercurry to Carrick on Shannon. The crews involved displayed great professionalism for a great cause. 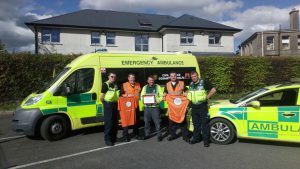 Westmeath Civil Defence provided medical assistance to the annual Cycle against Suicide day 9 from Carrick on Shannon to Mullingar on Sunday 6th May. On Monday 7th May another crew was activated for day 10 from Mullingar to Lucan.